Get the surreal puzzle game for nothing ahead of the developers' next game, Figment. 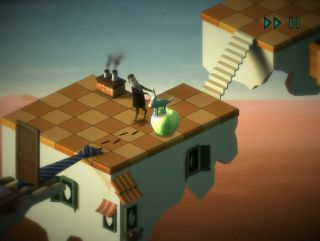 Back to Bed is a puzzle game about saving a sleepwalker named Bob from falling off ledges. As a creature from his subconscious named Subob, you have to block his progress across rooftops and sky-ledges with oversized green apples to steer him back to bed. As you do. It's not just surreal, it's surrealist, with art and props that reference the art of Salvador Dali (melting clocks, floating eyeballs), M. C. Escher (stairs to nowhere, interchangeable walls and floors), and René Magritte (bowler hats and those green apples). Originally released back in 2013, Back to Bed's unusual aesthetic and warped voice-acting, which sounds like it was spoken backwards and then flipped front-to-back again, were pretty memorable. Its creators at Danish studio Bedtime Digital have now made it free on Steam in advance of the release of their new game, Figment, which looks more cartoonish and action-oriented but no less strange. It's set inside someone's mind, each of the bosses represents one of their fears, and it's also a musical. Figment is out on September 22.